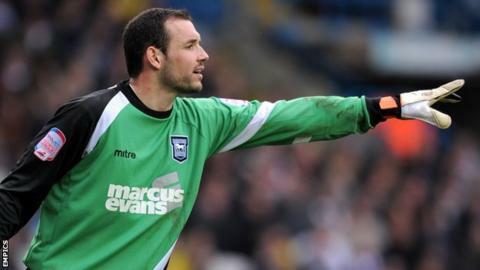 Ex-Sunderland and Ipswich goalkeeper Marton Fulop has died at the age of 32. The former Hungary international had a tumour removed from his arm in 2013 but was cleared to continue his career. He played 47 times for the Black Cats between 2006 and 2010 and last appeared for Town in 2011, making 38 appearances for the Suffolk club in all. "It's desperately sad when we lose a Sunderland family member but to lose one so young in such circumstances is heartbreaking," the Black Cats said. Fulop also played for Tottenham and West Brom and had loan spells at Chesterfield, Coventry, Leicester, Stoke and Manchester City. Scotland Under-21 coach Ricky Sbragia, who managed Fulop at Sunderland, said the goalkeeper was "different class". He added: "Marton was a lovely man - you talk about being a good friend and doing everything for you and being there. "He was great for me as a manager, he did everything I asked and kept us in the Premier League at a time when Craig Gordon was injured. "He was a big focal point in the team and I've got great memories of him." Ipswich Town said: "Our thoughts are with Marton's friends and family at this immensely difficult time." Paul Jewell, Fulop's former manager at Portman Road, told the club website: "I worked with him for a short time at Ipswich and he was a great pro. "He was a gentle giant and a very respectful person. He was just a good bloke and he was liked by all his team-mates. It's tragic news and my condolences go out to his family and friends." West Brom keeper Ben Foster, who trained alongside Fulop when the Hungarian was at the club between 2011 and 2012, said: "Rest in Peace Marton Fulop, one of the good guys and taken way too early. Thoughts and love go to the Fulop family." Former Sunderland defender Danny Higginbotham said: "So sad to hear the news of Marton Fulop. Spent a lot of time with him at Sunderland - one of the good guys. Thoughts with his family." Fulop spent three years at Spurs between 2004 and 2007, although he never played a first-team game. Former Spurs team-mate Ledley King fondly remembered his friend, saying he was "shocked and saddened by the news".